About this Salad Shaker Set:Salad Shaker Set. Salad Shaker Set Holds Up To 4 Cups Of Salad.Fork Slides Into Lid For Convenient Storage.Removable Dressing Container Nests In Lid And Holds Up To 4 Tablespoons Of Dressing.Meets FDA Requirements.Hand Wash Recommended.BPA-Free.Special Instructions:Rush Service:Catalog Quantities Only.One Color And One Location. About this Salad - To - Go Salad Shaker With Fork:Durable 3-piece salad shaker set serves both as a lunch box and salad shaker imprint on side. Includes large main compartment, small compartment for milk, dressing or other condiments that easily sits and stores in lid and fork with side storage slot.Made of food grade polypropylene plastic.Disposable plastic fork included to match accent color.Small compartment holds up to 2 oz (4 TBSP). Main Compartment holds up to 4 Cups/1L. Main compartment lid screws on. Hand wash only.Do not microwave. About this Solid - Color Three Portion Plate:Durable food grade polypropylene plate has three compartments to help with portion control. Large half is recommended for fruits and vegetables, and two smaller quarters for grains/starches and meats/proteins. Reinforces balanced eating and a healthy diet. CPSIA compliant. Top rack dishwasher safe. BPA Free. Microwave safe.Special Instructions:Rush service: 1-color/1-position required. Item color assortments are not available. About this Natural Wood Dishwasher Safe Bamboo Spoon:Bamboo is used in kitchens around the world.amateurs and professionals alike will approve of this great design.Naturally heat and bacteria resistant and it comes from a renewable resource.Convenient hanging hole for easy storage.Dishwasher safe.Material: Bamboo. Due to this product's variance in composition, laser engraving may produce different shades of imprint. About this Party Valet Snack Wine Tray:With only one hand you can hold snacks and a glass of wine.Beverage holder designed to accommodate a soda can, coffee cup, cocktail or wine glass.Dishwasher safe.Stackable.Imprint is screened on the bottom side of tray so the crystal material highlights your message while keeping food from contacting the ink.Material: Crystal Styrene. Everything In One Hand Versatile Beverage Holder Stackable Dishwasher Safe Everything In One Hand The Party Valet Snack & Wine Tray conveniently allows you to carry both your snacks and a glass of wine in one hand. Versatile Beverage Holder Not only can this snack and wine tray hold a wine glass, it can accomondate a soda can, coffee cup, or cocktail glass. Stackable Throwing a large party? These trays are stackable, making them convenient to carry in large quantities. Dishwasher Safe These customized snack and wine trays are re-usable and dishwasher safe, making them great souvenirs after events. About this Soup Mug:Soup mug with handle; Holds three cups. Locking lid with silicone gasket. Cap on lid to release heat. Freezer and microwave safe; BPA free! Materials: Polypropylene. About this Liquid Medicine Dispensers Med - t - spoon (2 Tsp - 10 Ml):This large spoon has measurements in tsp and ml for a wide range of dosing options. Complies with FDA. NOTE: Product comes with Prop 65 warning label. Label reads: "WARNING: This product may contain carcinogen, which is known to the State of California to cause Cancer, and birth defects or other Reproductive Harm. For more information, go to www.P65Warnings.ca.gov. About this Arroyo Portable Cutlery Set:Convenient portable and reusable tableware set includes knife, fork, spoon and cover. 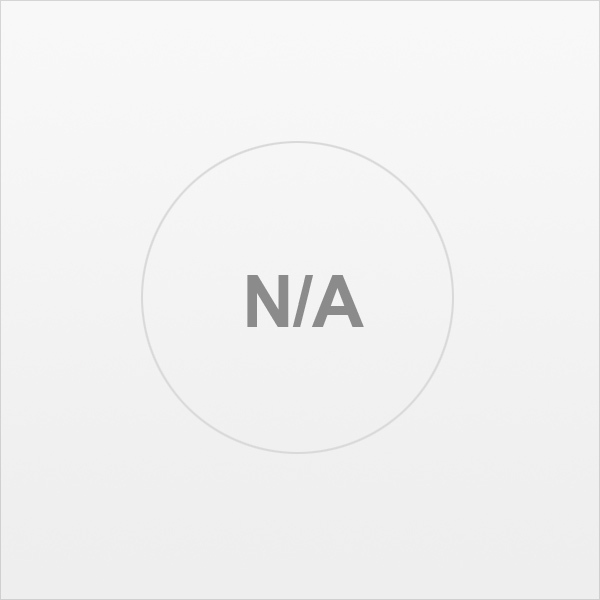 Finish / Material: ABS Plastic, Polypropylene. Tough ABS Plastic. Carrying Case. BPA-Free.Special Instructions:Rush Service:1. Purchase Order must clearly state artwork instructions and logo to be used.2. One Color/One Location Imprint Only. About this Insulated Lunch Box Food Container:Insulated food container with folding handles allow you to carry like a classic lunch box. The inside layer is stainless steel while the outer layer is plastic helping to keep food warm or cold. FDA Compliant. BPA Free. 900ml. Material: Double Wall Plastic.Notice: This product cannot be used in the microwave.Special Instructions:Other imprint methods/areas may be available; please call for details. Please note that product images may not depict the standard imprint method included in pricing. About this Rancho Portable Cutlery Set:Cutlery set includes fork, knife and spoon in convenient durable ABS transparent storage case with handy 50mm aluminum carabiner. Finish / Material: ABS Plastic, Polypropylene. BPA-Free.Special Instructions:Rush Service:1. Purchase Order must clearly state artwork instructions and logo to be used.2. One Color/One Location Imprint Only. About this Color Dip Snack To Go:Enjoy your favorite yogurt or snack on the go. Four piece set includes cup, cup lid, domed lid, and spoon. Place your favorite snack into the cup and store any toppings in the top domed piece. Reusable spoon stows away on attached clip. Material: Acrylic. Manufactured By Leeds.Special Instructions:Other imprint methods/areas may be available; please call for details. Please note that product images may not depict the standard imprint method included in pricing. About this Punch Oval Food Container:Part of the Sour Punch Trend Collection, the on-trend color pop is sure to turn heads. Oval base includes two compartment nesting tray and reusable spoon. Lid with steam release silicone plug for easy ventilation. Silicone band on lid and snap closure hinges keep contents fresh and secure. FDA complaint. Material: Polypropylene. Manufactured By Leeds.Special Instructions:Other imprint methods/areas may be available; please call for details. Please note that product images may not depict the standard imprint method included in pricing. About this Soup To Go Mug:Soup mug with handle includes vented lid with snap closure.FDA compliant.BPA free.Microwave and dishwasher safe.Material: Plastic.Special Instructions:1 Day Rush, available upon request for 1 color, 1 imprint location orders. About this Round Insulated Lunch Box Food Container:Round insulated food container with folding handles allow you to carry like a classic lunch box.The inner stainless steel lining with plastic outer case enables food to stay warm or cold longer.FDA complaint and BPA free.Material: Stainless steel with plastic casing.Special Instructions:Other imprint methods/areas may be available; please call for details. Please note that product images may not depict the standard imprint method included in pricing. About this 3 Piece Cutlery To Go Set:Reusable cutlery set includes spoon, knife and fork.Lid keeps utensils together.All FDA compliant.BPA free.Dishwasher safe.Material: Polypropylene.Special Instructions:1 Day Rush, available upon request for 1 color, 1 imprint location orders. About this Collapsible Silicone Bowl:Compact and easy to store this collapsible bowl is great for on the go.Silicone bowl easily folds in to store flat.FDA complaint.BPA free.Material: TPR.Special Instructions:1 Day Rush, available upon request for 1 color, 1 imprint location orders. About this Sandwich Container:Meets FDA Requirements.Hand Wash Recommended.BPA-Free.Special Instructions:Rush Service:Catalog Quantities Only.One Color And One Location. About this Two Tier Insulated Oval Lunch Box Food Container:This insulated two tier food container with folding handles allow you to carry like a classic lunch box.The two tiers enable you to keep food separated.The inside layer is stainless steel while the outer layer is plastic enabling food to say warm or cold longer.FDA Compliant.BPA free.Material: Stainless steel with plastic casing.Special Instructions:Other imprint methods/areas may be available; please call for details. Please note that product images may not depict the standard imprint method included in pricing. About this 3 Piece Salad Shaker Set:3 piece set includes dressing container, salad container with lid and fork.FDA compliant.BPA free.Microwave and dishwasher safe.Material: Polypropylene.Special Instructions:1 Day Rush, available upon request for 1 color, 1 imprint location orders. About this 2 Compartment Bento Box with Phone Stand:Bento style food storage 2 compartment container with added phone stand.FDA compliant.BPA free. Material: Plastic.Special Instructions:1 Day Rush, available upon request for 1 color, 1 imprint location orders. About this 3 Piece Cutlery Set:Includes Fork, Knife And Spoon.Protective Cover Holds Set Together And Keeps Utensils Clean.Meets FDA Requirements.BPA Free.Hand Wash Recommended.Special Instructions:Rush Service:Catalog Quantities Only.One Color And One Location. About this Three Compartment Food Storage Bento Box:This BPA free 3 compartment bento box is perfect for packing a healthy meal. The container features sections for a main dish and two sides. Item is microwaveable safe allowing meals to be heated.Material: Plastic.Special Instructions:Other imprint methods/areas may be available; please call for details. Please note that product images may not depict the standard imprint method included in pricing. About this Salad To Go Container:Set includes removable compartment tray that holds a dressing container and nests neatly on top of the container.Fork and knife included on the inside of the lid.FDA Compliant.BPA free.Microwave and dishwasher safe.Material: Polypropylene.Special Instructions:1 Day Rush, available upon request for 1 color, 1 imprint location orders. About this Multi Compartment Lunch Container:Compact with 3 compartments this container helps to keep foods separate.Includes one large compartment on one side and two compartments on the other side.FDA compliant.BPA free.Microwave and dishwasher safe.Material: Polypropylene.Special Instructions:1 Day Rush, available upon request for 1 color, 1 imprint location orders. About this Cool Gear(R) Deluxe Salad Kit:Freezable gel tray keeps your salad, topping & dressing cold. 4-cup salad bowl with freezer gel veggie tray. Contains removable separate container for dressing. Snap closure hinges on lid keep contents fresh and secure. Patented design. All FDA compliant and BPA-free. Manufactured By Leeds. Note: Instructions Included: No Materials: PolypropyleneSpecial Instructions:Other imprint methods/areas may be available; please call for details. Please note that product images may not depict the standard imprint method included in pricing. About this Heat It Up 24 oz. Soup Cup:Reheat or freeze soup, stew or other leftovers in this 24 oz capacity polypropylene cup. It features a snap-on lid with silicone seal and ventilation hole and an ergonomic handle. It's microwavable and BPA-free. Finish / Material: Polypropylene, Silicone. Thank you Laura, Delaney, and Jonathan. The bamboo spoon is a popular item in our dishware. These spoons are a favorite item for customers to take home and use. Our Natural Wood Dishwasher Safe Bamboo Spoon is great for home trade shows, but also great to give at cooking clubs/classes, or tagged along in a gift set for employees. Bamboo is used in kitchens around the world. Amateurs and professionals alike will approve of this great design. Naturally heat and bacteria resistant and it comes from a renewable resource. Convenient hanging hole for easy storage. 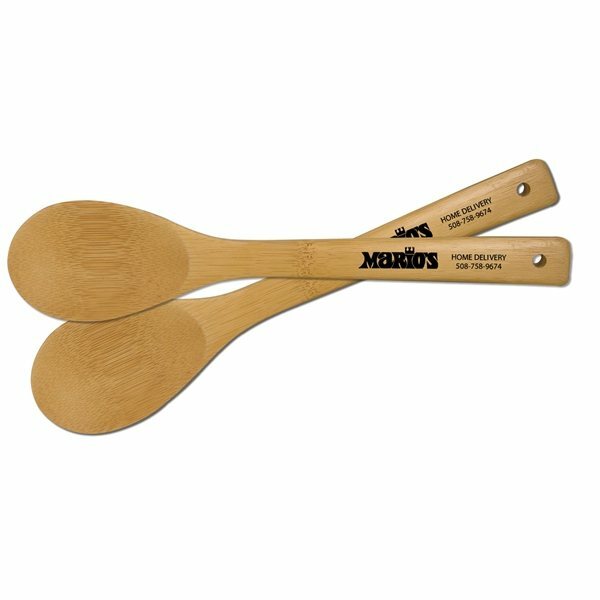 Purchase your Natural Wood Dishwasher Safe Bamboo Spoon now! Thank you Erica, Kathryn and Pearla! We’re very glad to see your kind reviews. We always make sure to make our customers’ experience easy, whether on the phone or online. The Salad-To-Go Salad Shaker With Fork is a great item to give any customer! As an employee incentive or a gym club, customers will love to take pack their salads in this container. It makes packing lunch much easier! Durable 3-piece salad shaker set serves both as a lunch box and salad shaker imprint on side. Includes large main compartment, small compartment for milk, dressing or other condiments that easily sits and stores in lid and fork with side storage slot. Made of food grade polypropylene plastic. Disposable plastic fork included to match accent color. Small compartment holds up to 2 oz (4 TBSP). Main Compartment holds up to 4 Cups/1L. Main compartment lid screws on. Hand wash recommended for imprinted product. Available in blue, lime green, white, and red. Purchase your Salad-To-Go Salad Shaker With Fork today! Thank you Isabelle, Veronica and Sharon for your reviews! We’re glad your logos came out perfectly. We always aim for our products to come out perfect! The Party Valet Snack & Wine Tray could be used at parties, or huge events to carry food. 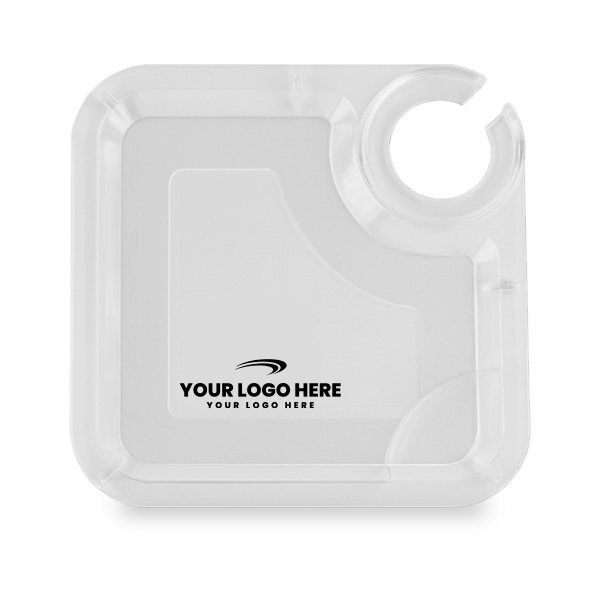 Remind your guests or customers know what event they’re at with the logo on this tray. With only one hand you can hold snacks and a glass of wine. Beverage holder designed to accommodate a soda can, coffee cup, cocktail or wine glass. Imprint is screened on the bottom side of tray so the crystal material highlights your message while keeping food from contacting the ink. Order your Party Valet Snack & Wine Tray here. With over 200 items in our promotional dishware selection, your kitchen gurus will love to receive our items! Bring a sense of contemporary style to your customer’s kitchen! From containers, toothpicks, party trays, spoons, lunch boxes to shakers cups, we have them all available in our selection! What’s your company’s style of dishware? Dishware is great to give at big events because customers are always using containers to pack their food. This marketing technique will allow for your logo to be seen by many potential customers! Choose your perfect dishware! Need dishware for a party? We have many dishware sets that will make planning much easier for the hosts. Look through our dishware today. Shop here! Our promotional dishware products are specially priced and professionally imprinted to vividly promote your brand. Search our site for a wide selection of dishware including melamine platters and more! See for yourself just how high AnyPromo’s standards are when it comes to brand impact. Click through our inventory of promo dishware gifts on sale now. Here is a snapshot of our selection of promotional dishware currently available. We’re ready to help expedite your order, so give us a call! Add pizazz to food presentation with these great promotional gifts! Add a dishware with your logo to your company’s kitchen! Whether it’s a club or for your employee, dishware can always be convenient to the customer. We have many containers that could be useful everyday! Containers to hold salads, soups, sandwiches, cutlery, and more! Get your specific container today. If you’d like more information on our following featured list below, feel free to live chat with one of our customer service representatives. They are always standing by to help you make a decision.